January 18, 2011 – Wide Receiver Chris Briggs from Franklinton High School has a number of offers from in state as well as out of state colleges. 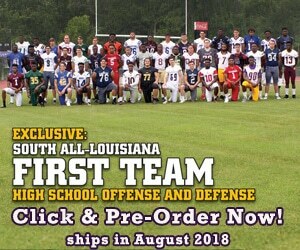 ULL, ULM, LA Tech, Southeastern, the University of Minnesota, and the University of Pittsburgh have all offered as well as a few other smaller schools. Briggs said the top colleges that he would like to attend are Tennessee, LSU, Southern Mississippi, Minnesota, and Pittsburgh, and LSU, in fact, visited Briggs at his house two nights ago. Out of all these schools, Briggs said that he really doesn’t have a favorite and that he would be happy to play football for any of them. Briggs is 6-5, 180 pounds, runs a 4.5/40, and carries a 2.8 GPA in school. In the weight room, he benches 265, cleans 260, and squats 415. Briggs said that his tall stature really plays to his strengths as a wide receiver. Briggs finished the season with some excellent stats. He had 60 receptions for 16 touchdowns and 870 yards. Briggs said that he’s influenced by his uncle Jake Reed who played for the the Minnesota Vikings.